You can track orders we ship to you by UPS using either Cords' invoice number or the UPS tracking number, which we can provide upon request. 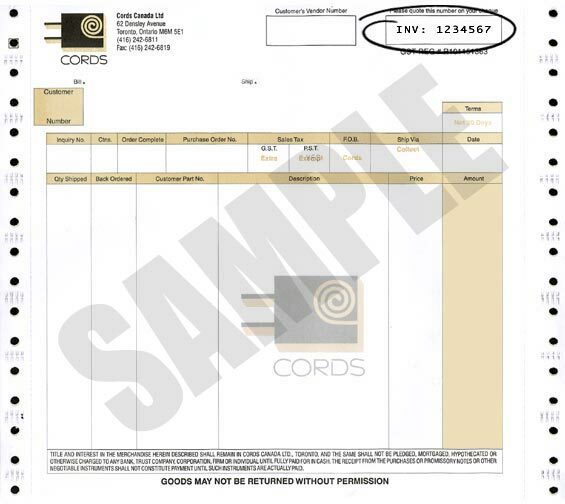 See sample Cords invoice below to locate the invoice number. Track Your Order with Cords Invoice No. To find out the status of your order, enter your Cords Canada invoice number into the field below and then click the Track Cords Number button. Track Your Order with UPS Tracking No. To find out the status of your order, enter the UPS tracking number of your order into the field below and then click the Track UPS Number button. The Cords Invoice number is located in the top right portion of the invoice.